I am a bit confused. As of the MAPNIK policy issue, my app started to show empty maps lately. As it was for old users with full cache only lately, I wonder how many users considered the app broken, as the app never showed a map to them? I did an emergeny build to switch from MAPNIK to OpenTopo. But maps are not getting smooth lately, so I fear, they are either overloaded now, or also start to enforce policies? So sooner or later as cache expires, map will probably black out too?! I tried to the 6.1.0 snapshot to get back to MAPNIK, but they to block now, I only get "forbidden" http headers from them? Retrieving the old "change user agent" trick (cf. #366 ) with the new API seems to help a bit. But can it be considered relyable? By now I am really puzzled, how get my app to work reliably again? @InI4 Too many things at the same time. is there a (possibly old) version of osmdroid that works OK today, MAPNIK-wise? @monsieurtanuki I apologize, I was a bit in a state, when users reported losing their maps (when there is nothing in cache, cause you are either new, or you go to a location, you haven't been before). One more question which kind of makes it a feature request: I failed to find an API to determine, if a map provider has an issue. Background: I will add a whole bunch of map providers to my app now, to let users choose. It would be nice, if the app could tell them, there is a problem with tile loading and user should switch map tile service ... or even to switch automatically. I've just sent a message to the MAPNIK guys regarding the "forbidden" tiles (cf. #1288). I'm currently working on static tile provider stats. Digging into things, I also realized, that I once hat the calls active to change the USER-AGENT for my app. Then, after some API change, that call was not working any more and so my app did probably also run with the default user agent again, which is probably a very bad idea. (I crossposted this from #1288). // If you have a classification of failures, you could also add different amounts depending on type. This gives a value between 0.0 and 10.0, where 0.0 means all requests worked, 10.0 means, infinitely many requests failed and a single failure means >= 1.0. I'm not really into your failure detection, it's too sophisticated for me. Currently I cannot use OpenTopoMap anymore: timeout for https://a.tile.opentopomap.org/12/2103/1345.png or https://opentopomap.org/12/2103/1345.png. Maybe it's the "kiss of death": OpenStreetMap and osmdroid are so popular now that the servers crash and they need to apply stricter rules when the servers are up. A statistic about the different providers is also a great idea. It can well be, that osm infrastructure has come under pressure lately. So if you did such measures you might need to repeat them on different times of day, times of week? How long was it, when they tried to enforce better client headers? We hat these policy waves more than once. I'm part of the OpenStreetMap.org sysadmin team. Yes, we have blocked the unset default user-agent of osmdroid. Please set a real app user-agent eg: github-firefishy-map/0.1 and your app(s) will work again. @InI4 Actually I do plan to create a broader "OSM vs. osmdroid" issue - as evoked with @Firefishy in private mail exchanges. Regarding your point, the trouble is that the user agent is already supposed to be set to the package name by default (cf. DefaultConfigurationProvider). By curiosity, how do you manage to populate your user agent with another value? You don't use DefaultConfigurationProvider? You explicitly overwrite the user agent value? @monsieurtanuki Please drop the "OSM vs. osmdroid" wording. OpenStreetMap has extremely limited resources (admins, servers, bandwidth) and all not for profit... The block on the osmdroid user-agent is because apps using the library are not following our policy. The policy is to keep our services from grinding to halt. Last week osmdroid was the highest non-browser user-agent and services in some regions were severely degraded (see linked issues above). @Firefishy Oh, I get your point: I didn't mean "against", I just wanted to give a temporary short title with both names osmdroid and OSM. I rather meant something like "osmdroid and a correct use of OSM resources". Apparently "vs." has too aggressive a meaning, my translation into English was not correct. @monsieurtanuki my bad, the DefaultConfigurationProvider code I see, is nearly what I was trying to suggest: It retrieves the package name. So only an minor suggestion would be to attach a "/"+PackageInfo.versionCode as suggested by @Firefishy above. As this is suggested, this would help an app to get access again after an update. Only bad for the OSM guys, when you didn't fix the DOS aspect ..
the OSM servers won't even have to reply with a "403 forbidden" to requests that won't be sent to them. As for the value of the user agent, should it include the version number? Unless there's an explicit need expressed from OSM, I guess we can skip the version code part for the moment. Anyway we're talking about an init default value for the user agent, that developers can overwrite whenever they want. That way if there is a faulty version of an app which caused problems, it could be filtered instead of filtering all versions of the app. Fair enough. Unfortunately we (in osmdroid) set a default user agent only when the app is launched for the very first time. Then the value is kept and not automatically updated. Therefore, in the best situation the user agent will always be the package name and the version number of the first installation. 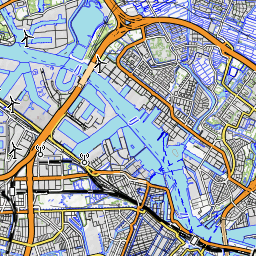 No version number change will be sent to OSM. we can force this value for the user agent sent to OSM, regardless of the user agent value that we (in osmdroid) computed and used so far. @Firefishy Does that make sense? package name + version number: just PR'ed in #1293. Once I used: OpenStreetMapTileProviderConstants.setUserAgentValue(getApplicationContext().getPackageName()): instead, that resolved the problem. The problem is, when our tested tried reporduce the problem on the same device with version of the app without the aforemenioned change, it wasn't blocked. Why would this happen? shouldn't it have blocked it once it had seen the invalid user-agent value? they did that by blocking requests whose user agent is/starts with "osmdroid"
your user agent string was/started with "osmdroid"
I went back and looked at the logcat output for the version of the app without the user agent fix (cf. #366 ), and it was blocking requests for the tiles, but still showing tiles for places that I had previously viewed but if I went to other places I hadn't been before, nothing was shown which means that those tiles were cached, which gives me more confidence in the user agent fix, when I was using that version of the app, it was a re-install, which should have removed the local tile cache, so where would have those intial tile images come from? any ideas? @ambrose-at-cordic The reinstall doesn't necessarily clear the tile cache, as it is (by default I think) directly in /osmdroid (I mean, not in /Android/data/...). For historical reasons (cf. #1233). Therefore, if the tile cache is not cleared, that would explain that you see cached tiles from one install to the other. If you want to perform a clear reinstall, think about deleting /osmdroid/tiles/cache.db (or something like that). No the maps have been working with no issues since then. From what I remember of the issue, I confirmed that for the version prior to the fix, any tiles that were accessible prior the block could still be viewed but if you went a place you hadn't been before, you wouldn't get the tiles, but in version with the fix, you would get those tiles, so it the fixed resolved the issue for us.